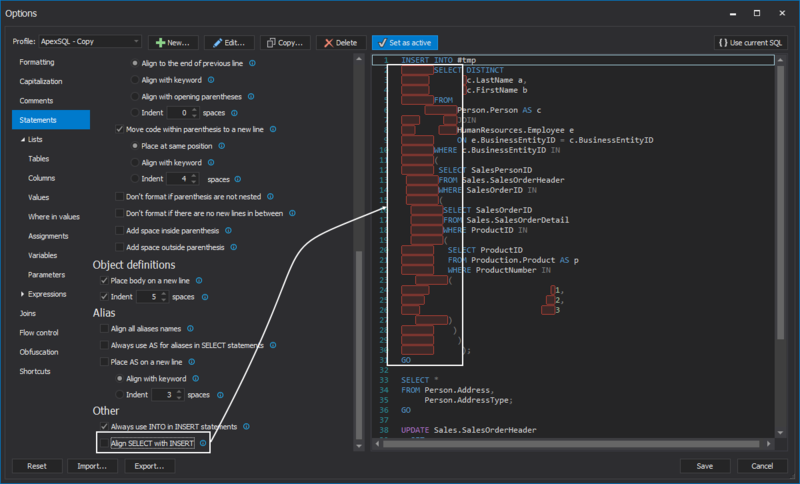 Does ApexSQL Refactor integrate with Visual Studio? Which SQL Server version ApexSQL Refactor support? Which SQL Server editions does ApexSQL Refactor support? Does ApexSQL Refactor support Azure SQL Database or SQL Server on Amazon RDS? 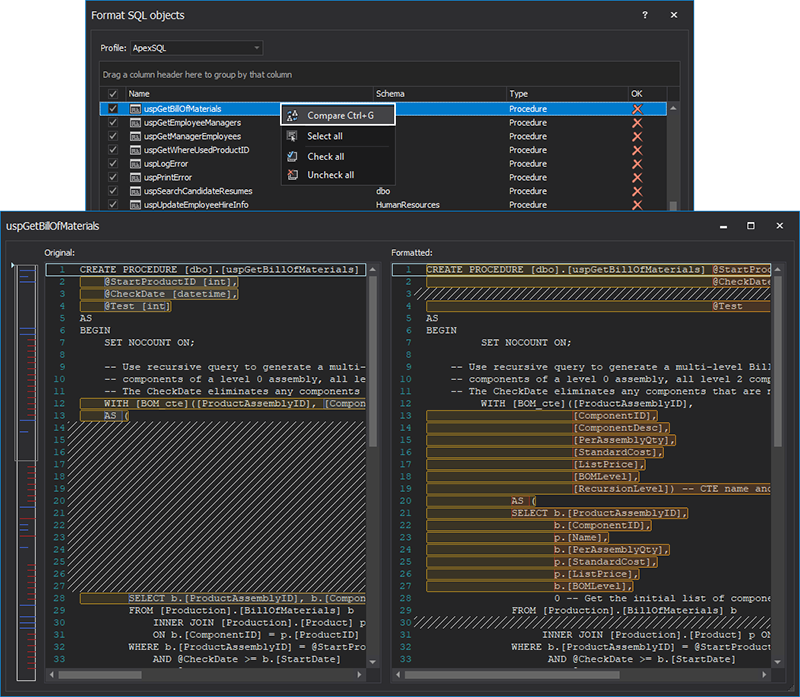 Does ApexSQL Refactor support Azure SQL Database Managed Instance? 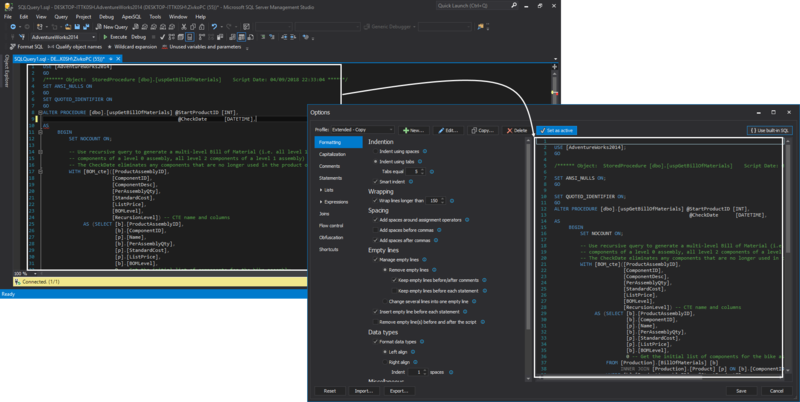 Which version of SQL Server Management Studio ApexSQL Refactor support? Does ApexSQL Refactor support Active Directory - Password authentication? Can I set up my own rules to format SQL? Yes, you can customize the SQL code layout with nearly 200 different SQL formatter options. Can I set up multiple user defined SQL formatter profiles? Can I distribute my SQL formatter options to other developers? Can I format SQL for multiple objects at once? Can I format SQL for multiple scripts at once? Using the batch SQL formatter, can I specify which objects to format SQL? Can ApexSQL Refactor tell me which objects need to be formatted, so I can format SQL for those objects only? Can I see the SQL object's script how it looks now and how will look like after formatting? Yes, before executing the batch SQL query formatter, you can compare a SQL object's script as it now and how it will look like after clicking ‘OK' to format SQL. Is there a "No format SQL" type tag to protect certain blocks of code from formatting? 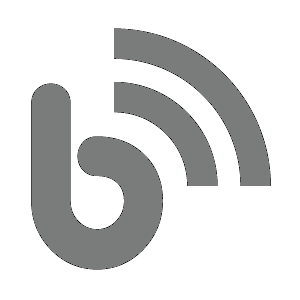 Does the ApexSQL Refactor SQL formatter have a CLI to format SQL unattended? Can I obfuscate SQL code using ApexSQL Refactor? What options are available for obfuscation? Can I preview the impact of changes? What SQL code is used to preview changes? Can I paste in my own? Can I format selected blocks of code? Does ApexSQL Refactor have options for casing of keywords (e.g. Select), built-in functions (e.g. Avg) etc.? Does ApexSQL Refactor have option for expanding wildcards? Does ApexSQL Refactor have option for qualifying objects? If I rename an object, will this change be applied to all its parent and children objects? Yes, you can rename tables, procedures, views, functions, parameters and columns without breaking any dependencies. Can ApexSQL Refactor change stored procedures parameters? Yes, the tool can add and remove parameters as well as change their names, default values and data types without impacting referencing objects. Can I encapsulate T-SQL code using ApexSQL Refactor? 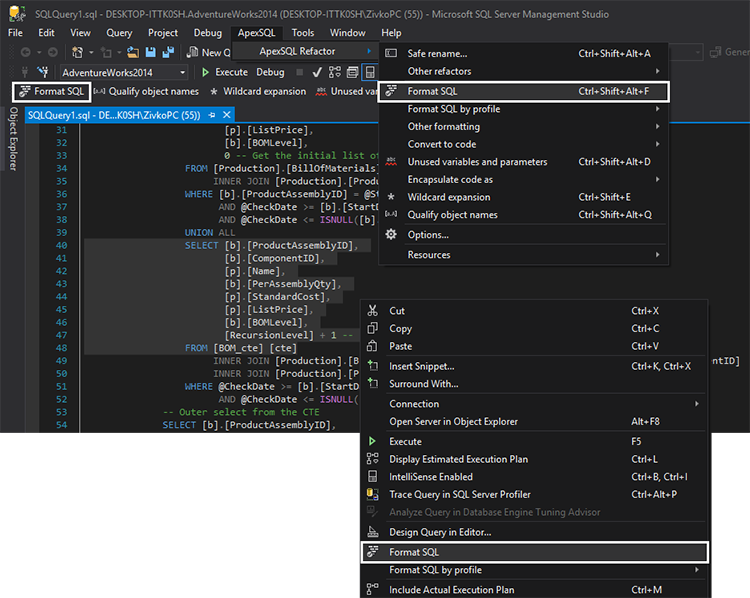 Yes, using Encapsulate code as feature you can creating a new stored procedure, a view, a scalar inline function, or a table inline function from any valid T-SQL code block. Can I split table into two tables using ApexSQL Refactor? Can I replace a natural key with a surrogate key using ApexSQL Refactor? Can I find unused variables and parameters in existing SQL Server stored procedures and functions using ApexSQL Refactor? Can I convert SQL code to language-specific client code (e.g. C#)? Yes, you can convert a T-SQL script into client language-specific syntax - Java, VB.NET, c#, Perl, PHP, Delphi, Ruby, C++, or other custom languages for which conversion rules are defined. Is ApexSQL Refactor free for personal and corporate use? Is ApexSQL Refactor open source?